Dimensions 6.0 In. X 9.0 In. X 4.0 In. 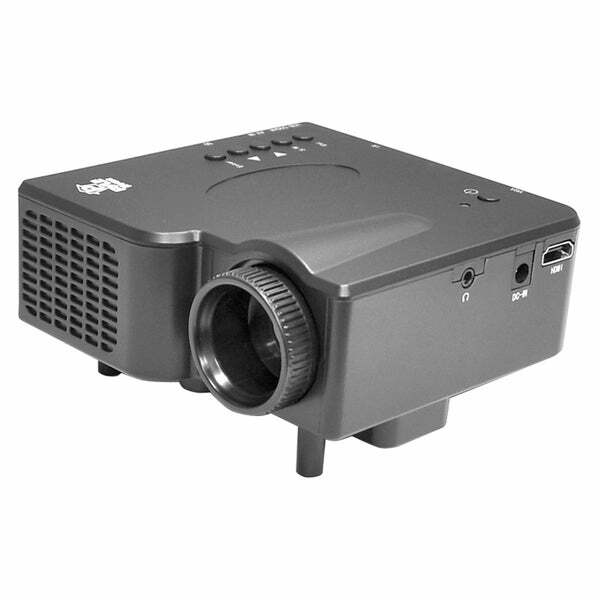 this projector may be great for small jobs like kids watching a movie or a smaller presentation. I end up returning it after doing a little research and finding a more suitable one for the job i needed. It showed a clear picture just not what i needed. Cheaply made. Had to return. This item did not meet my expectations. The resolution was poor. Not good for an office setting. Not worth the money. I would not recommend this to anyone. Was a waste of my time purchasing this. It functions like a toy. "Can the projected be connected to cable boxes, dvds, or other home entertainment systems? " "I received the projector that I ordered but it has no instructions. How do I connect to the laptop? The box says that it connects directly to the laptop but it has no cord(s) to do this. What do I need to get to be able to connect directly to the laptop? That is the reason I ordered this model because it said easy and connects directly to laptop." Hello Aaron/Gloria A., you will be contacted by Customer Care. Have a great day. "OstkUser 34949 Were you able to return this item without a hassel?" Hello Aaron/Gloria A., we can appreciate the fact you want a firsthand account of the product. You will receive an email notification every time you get a response. Thank you for shopping with us. "PyleHome PRJG45 LCD Projector - 4: Is this projector electrical or battery operated?" Hello Aaron/Gloria A., this item is connect to a 12 volt power adapter for operating. Thank you for shopping with us. "How do I subscribe to responses to questions?" Hello Aaron/Gloria A., you are welcome to subscribe by clicking the blue envelope beneath the question that says "subscribe". I hope this info helps. Thanks for shopping with us! "PyleHome PRJG45 LCD Projector - 4:--If I decide to return this item because I do not like the quality how much will be deducted from my account for returning it? Jennie"
Hello Aaron/Gloria A., this item is able to be returned within 30 days of delivery, in new and unused condition. Customers are asked to cover the cost of the return shipping.Thank you for shopping with us.